Here's a yummy St. Patricks Day treat idea! DIRECTIONSPour box of cereal out onto a large tray. Pick out all the marshmallows (about 2 cups); set aside to add to the mix later. 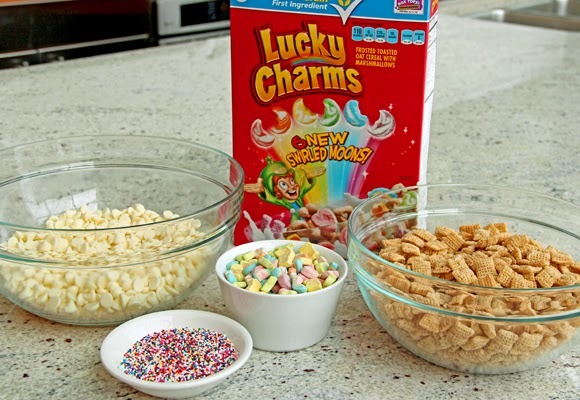 Measure 2 cups of the remaining Lucky Charms cereal (without the marshmallows) into large bowl, add Chex cereal.Line cookie sheet with foil or waxed paper. In medium microwavable bowl, microwave white vanilla baking chips uncovered on High about 2 minutes, stirring every 30 seconds, until chips can be stirred smooth. Pour over cereal mixture in large bowl; toss to evenly coat.Spread mixture in single layer on cookie sheet. Immediately sprinkle with candy sprinkles. Let stand until set, about 20 minutes. Gently break up mixture; toss in reserved marshmallows. Store in airtight container. see the full post here on Tablespoon!